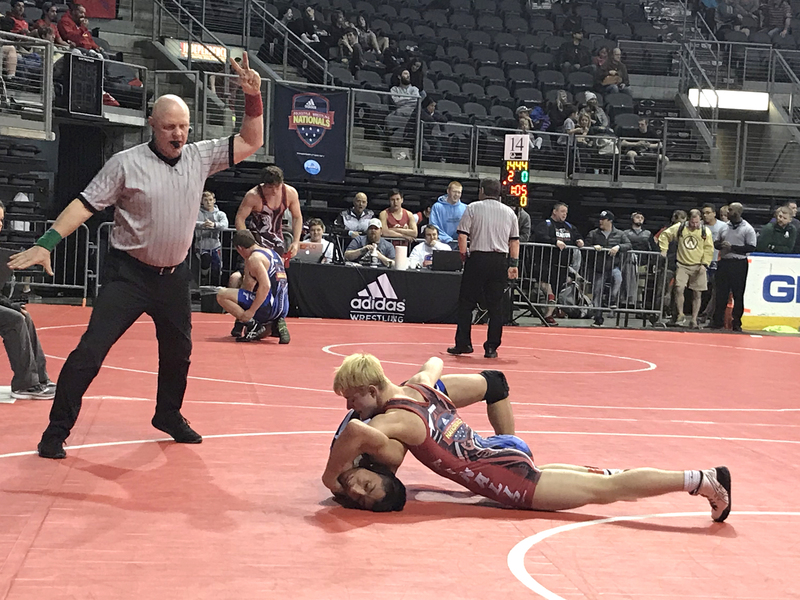 The 15th Annual Adidas Wrestling Nationals, formerly the Brute Nationals, was an experience to be remembered. For the past 15 years R.E.A.C.H.E.S. Sports has run this tournament as a way to give back to the wrestling community with over $450,000 being donated back to wrestling programs nationwide. Just a few short weeks ago on April 6-8th, 2018, over 1100 wrestlers from over 30 states descended upon the Silverstein Eye Centers Arena in historic Independence, Missouri with a goal of becoming the next Adidas Wrestling National Champion. As in prior years, Adidas Wrestling Nationals provides wrestlers with the unique opportunity to achieve All-American status in their weight class at their grade level as they compete for a National Champion title. Whether you competed for your spot to become a National Champion, watched anxiously from the sidelines or viewed the live stream on Flo Wrestling the intensity and tenacity these wrestlers have was a thrill to watch. If you are new to the tournament you might be pleasantly surprised when you find out what happens with all the profits from this event. Each year, R.E.A.C.H.E.S. Sports donates all proceeds back to the wrestling community to help fund programs like Oak Wrestling Club who recently were awarded a grant that was used to buy custom sublimated singlets for the youth program. Girard Wrestling also benefitted this past year from R.E.A.C.H.E.S. who helped provide new shoes, headgear and workout shorts to many kids who do not have the financial capability to purchase their own gear and who have use outdated equipment in past years. “To have the kids understand how wrestling can help change lives and create a great work ethic in the great young men and women I coach is my biggest goal here at Winnebago,” Coach Tranmer stated. Tranmer received a grant from R.E.A.C.H.E.S. Sports in Fall 2017. It’s not hard to tell with all that happens on the mat, at least twice as much time and effort is put into planning this type of event. Numerous volunteers spend countless hours planning, prepping and facilitating the event which packs the Silverstein Eye Center arena with over 5,000 attendees each year. 14 mats are filled with boys and girls, grades one through twelve weighing 37lbs to 288lbs. There are all shapes and sizes with one common goal of obtaining National Champion status. Congrats to our Men’s and Women’s High School Outstanding Wrestlers James Homfield and Karestin Andrews. Homfield, 9th Grade 106lb. National Champion, from Fenton, MO had 4 consecutive pins helping to secure his Outstanding Wrestler Award in the Men’s High School Division. Karestin Andrews, 9th-12th Grade 145lb. National Champion, from Grapevine, TX dominated her weight winning her the Outstanding Wrestler Award for Women’s High School Division. Hope Blake, girl’s 6-8th 104lb National Champion won the Outstanding Wrestler Award for Girls Grade 6-8th and placed third in 6th Grade boys 108lb. weight class. Joseph Gonzalez, 8th Grade 125lb. National Champion was the boys 6-8th Grade Outstanding Wrestler. Cole Caniglia, 3rd Grade 55lb. National Champion took home the boy’s K-5 Outstanding Wrestler Award and Savanna Franklin, Grade K-5 96lb. National Champion, took home the girl’s K-5 Outstanding Wrestler Award. Wrestlers, coaches, families, fans, and clinicians all gather for a great weekend of wrestling. Wrestlers seeking more matches were encouraged to participate in challenge matches throughout the weekend. Challenge matches are a great way to hone your skills while competing with wrestlers from over 30 different states. Of course, if you were looking to learn you could also participate in clinics on Friday and Saturday night hosted by 4-time NCAA Champion, Pat Smith. The annual crowd-pleaser Mohawk competition had another ground-breaking year with over 30 participants both male and female with awards to the top placers in both Men’s and Women’s categories. Yes, that’s right these ladies represented with some pretty cool hair styles! Check out the Adidas Wrestling Nationals FaceBook page for great inspiration on your next Mohawk. These kids and parents plan months in advance for this competition. It was another great year in the books for the men’s and women’s divisions. The men’s competition was ruthless with state champions meeting up to wrestle for national champion status. The women’s division had a record-breaking year as their attendance continues to grow year after year being the fastest growing segment in wrestling nationwide. 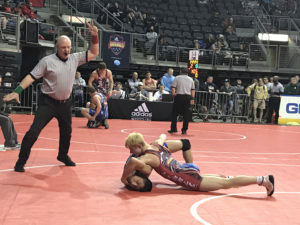 As for what you can expect from next year Adidas Wrestling Nationals, executive director, Walt Fisk, is pleased with this year’s tournament, but is not one to ever settle. “Bigger and better” is the goal, as the wrestling community deserves nothing less. Fisk is a retired wrestling coach with a goal of growing and supporting wrestling through R.E.A.C.H.E.S. For this reason, R.E.A.C.H.E.S. is always searching for new opportunities to reach wrestling programs in need. Check out www.reachessports.org if you have a need in your wrestling community. Congratulations to the 2018 Adidas Nationals All-Americans, the 2018 National Champions and the winners of the outstanding wrestler awards. Hats off to every wrestler who competed, the innumerable staff members and volunteers who brought this event to existence, and the many other nameless participants who played a role. Thank you to anyone who speaks a word about this competition, and gives a second thought to why R.E.A.C.H.E.S. holds this event. To see specifics about the tournament regarding individual performances, you can check out adidaswrestlingnationals.com or find the official Facebook page. To learn more about R.E.A.C.H.E.S., browse the website and stay up to date with our news, funding, and events. R.E.A.C.H.E.S. (Rewarding Educational Athletic Choices Helping Each Sport) is a nonprofit 501(c)(3) organization founded in 2007 in an effort to promote, protect and preserve the integrity of amateur athletics by providing athletic and educational opportunities to all athletes of all ages and abilities. This unique organization provides educational, technical, and lifelong lessons for athletes, coaches, parents and fans that seek to capture meaningful, compassionate, harmonious, interesting and active lives.